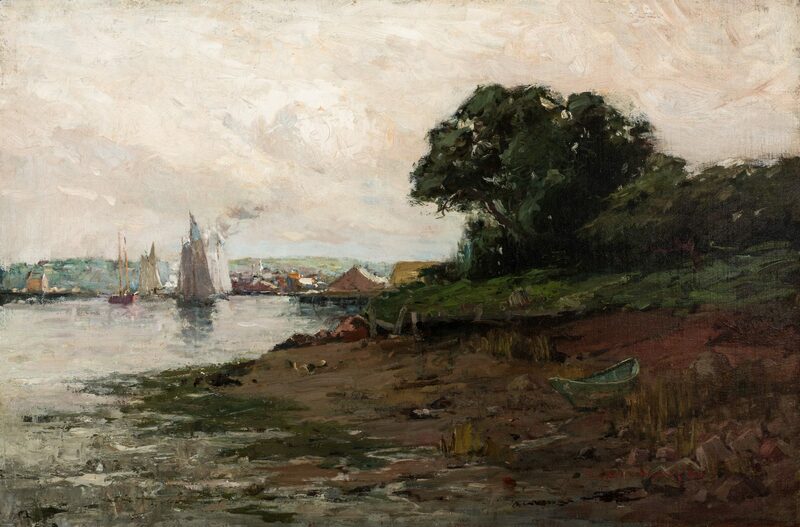 Charles Woodbury (Maine/Boston, 1864-1940) "Harbor at Low Tide," oil on canvas impressionist shoreline scene with sailboats in a harbor at left and village beyond; a lone boat sits abandoned at right. Signed and dated '84 lower right. 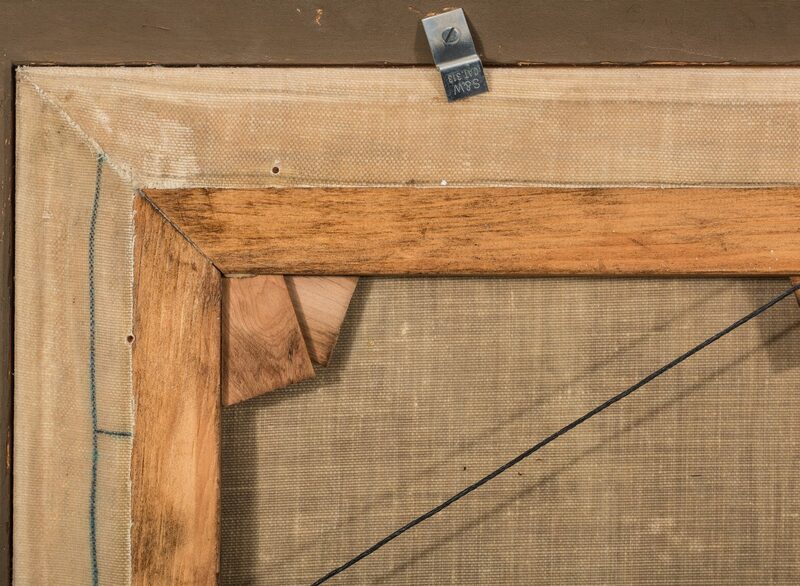 Later giltwood cove molded frame. 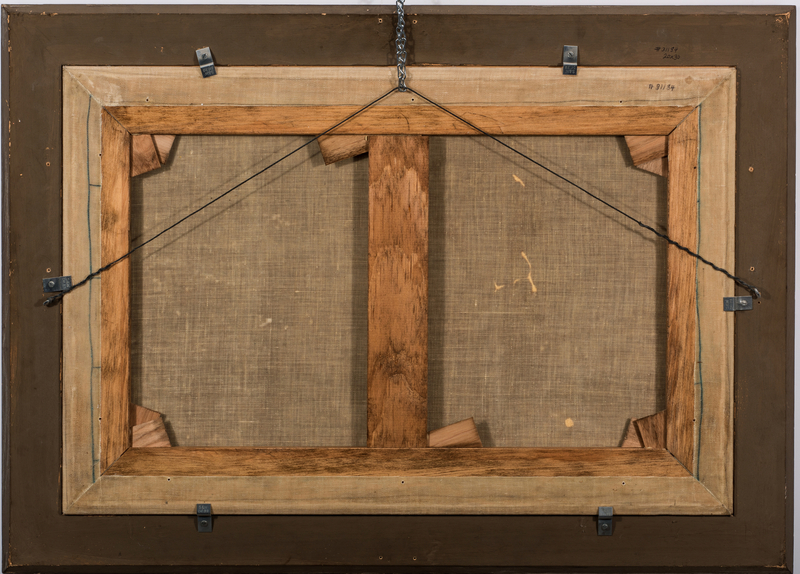 Canvas – 20" H x 30" W. Framed – 26" H x 36" W. Provenance: The collection of Mr. and Mrs. H.R. Slaymaker, Nashville, Tennessee. 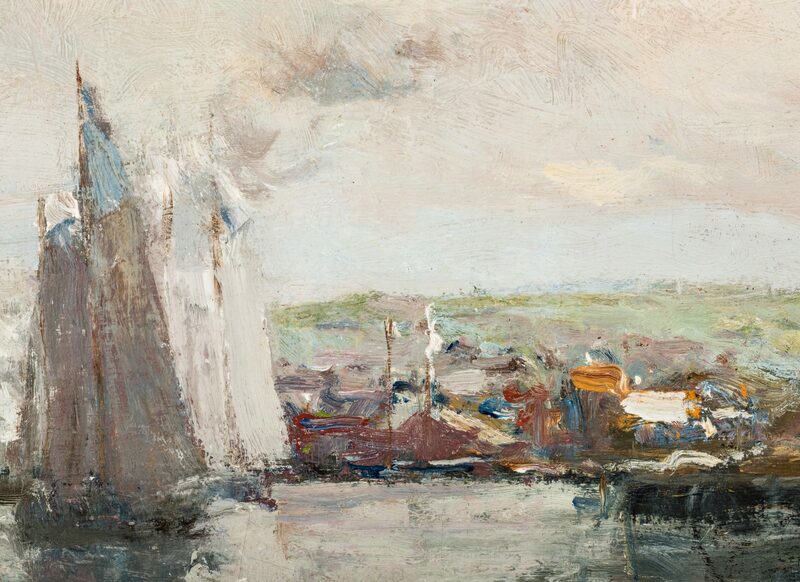 Biography: Charles Woodbury remains among the most influential artists to work in Ogunquit, Maine and in Boston. 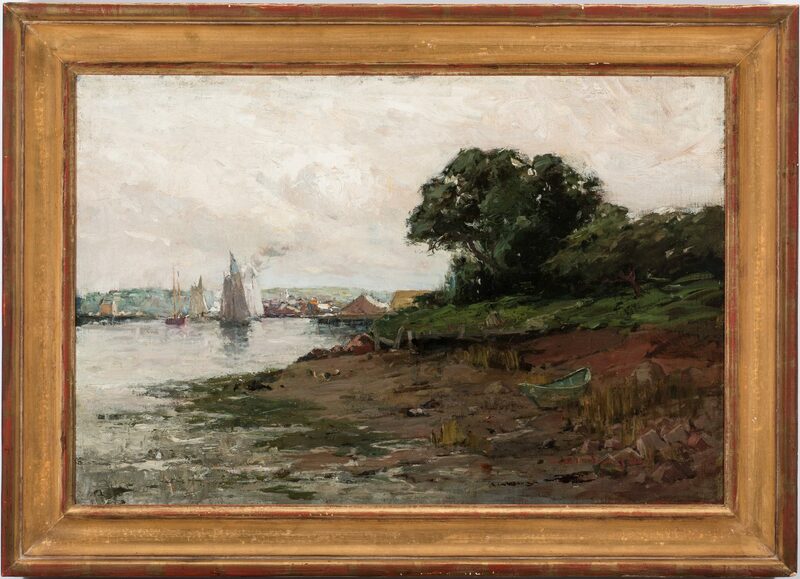 He sold his first oil painting when he was 15 and at age 17 in 1884, was the youngest person ever elected to the Boston Art Club. He graduated from the Massachusetts Institute of Technology and also studied at the Academie Julian in Paris. 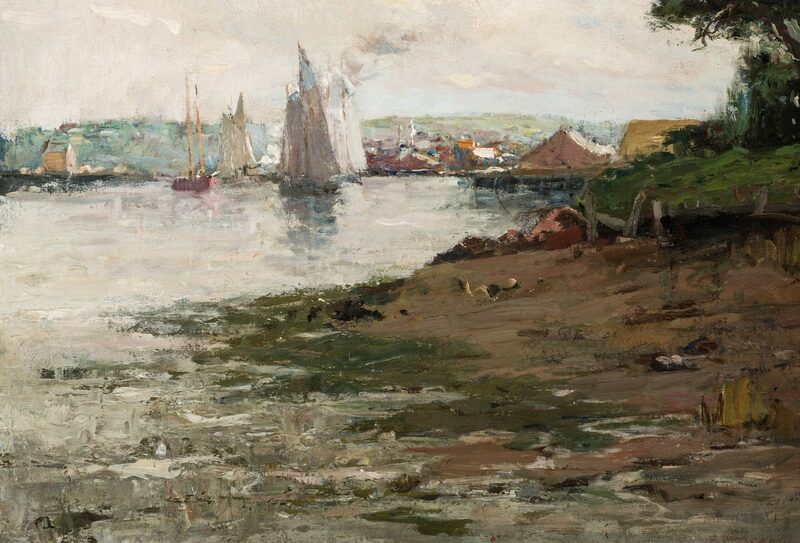 Returning to the Boston area, he became a prominent plein-air painter and living until 1940 embraced Impressionism. 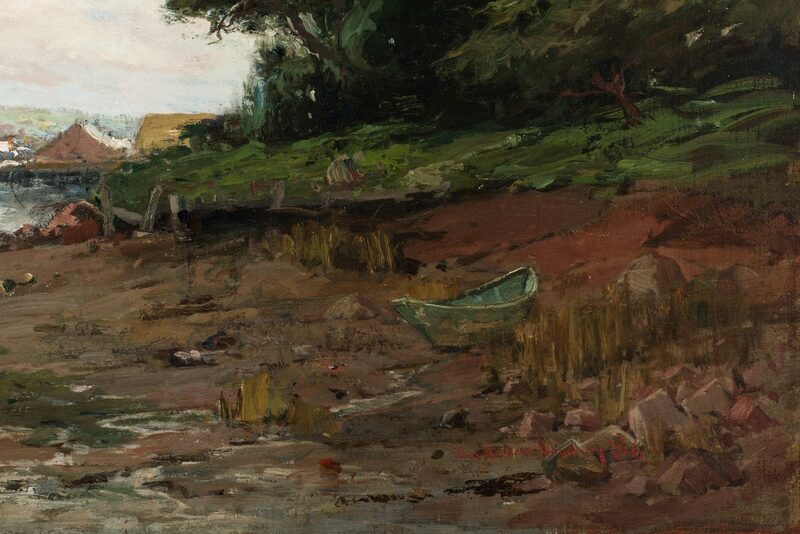 He was a leader among his artist colleagues in the formal application of paint in beach and marsh scenes, a unique subject for that time. 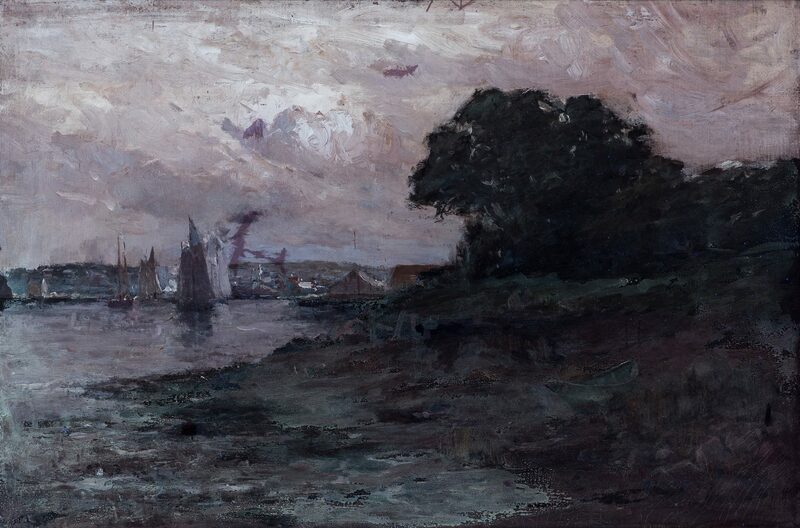 He was a member of the Salmagundi Club (1899); an Associate (1906) and an Academician (1907) at the National Academy of Design; Ogunquit Art Association; New York Water Color Club; and the Guild of Boston Artists. 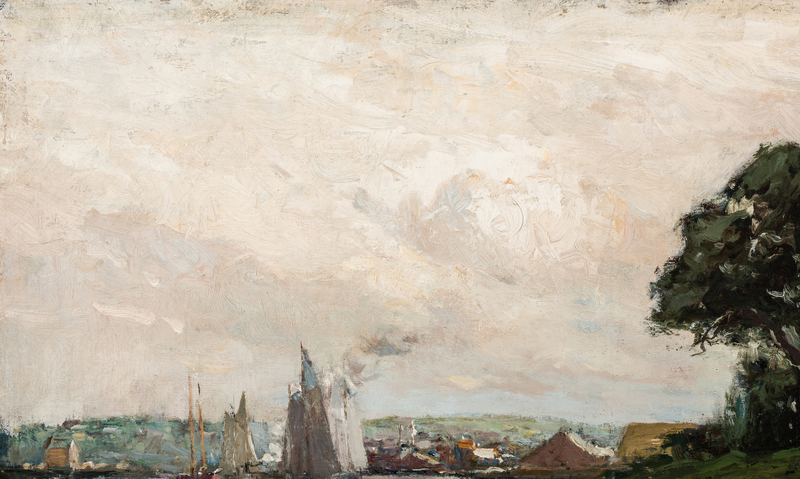 He won awards at the Boston Art Club (1884, 1895); Atlanta Exposition (gold, 1895); Nashville, Tennessee Centennial (1897), Mechanics' Fair, Boston; Paris Exposition (1900); Pan-American Exposition, Buffalo (1901); Worcester Art Museum (1903,1907); St. Louis Exposition (1904); Carnegie Institute (1905); Buenos Aires Exposition (1910); American Water Color Society (1911); W.A. Clark Prize and Corcoran Medal (1914); Pan-Pacific Exposition, San Francisco (gold, 1915); Penn. Academy of F.A. (gold, 1924); Brooklyn (1931); Palmer Marine Prize and Ranger Fund Award, National Academy (1932); Noyes Prize, Society of American Artists (1933). 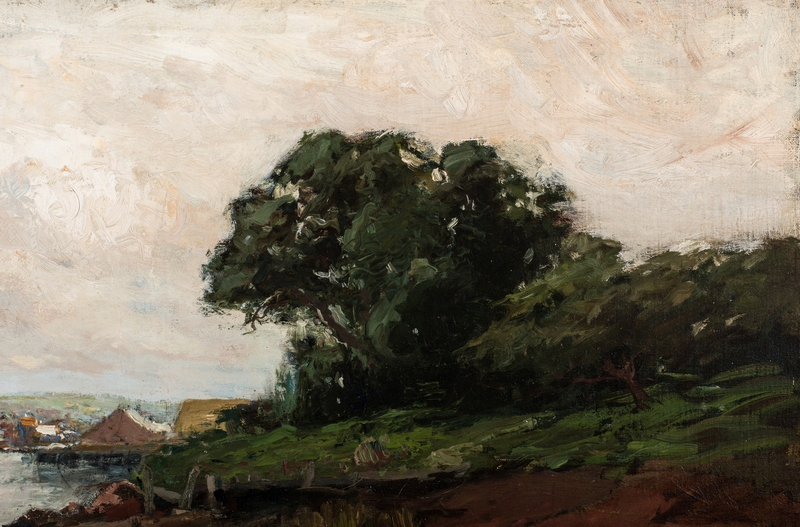 He is represented at the Gardner Museum; Corcoran Gallery of Art; Art Institute of Chicago; Herron Art Institute; Boston Museum of Fine Arts; St. Louis Art Museum; Boston Public Library; Berkshire Atheneum; Detroit Art Institute; Metropolitan Museum of Art; Joslyn Art Museum; Worcester Art Museum; R.I. School of Design; Telfair Academy, Savannah; Colby College; and Wellesley College, where he also taught. 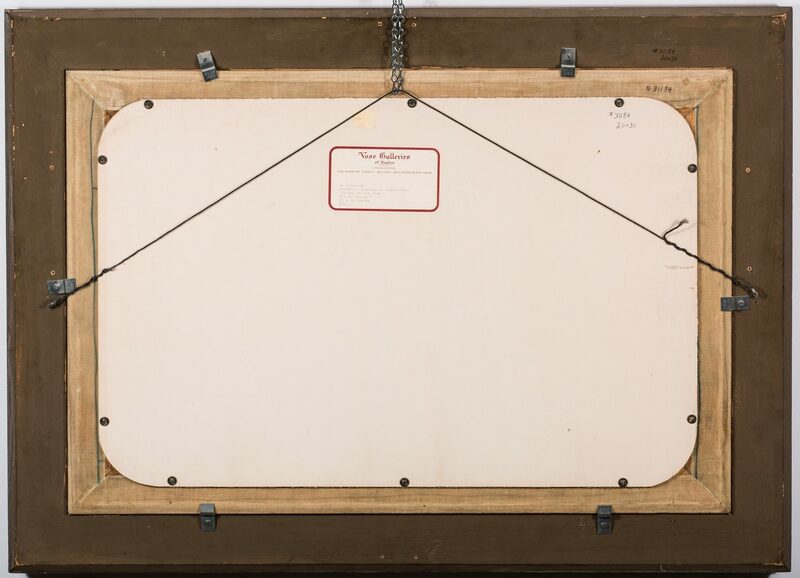 Woodbury was given over 60 one-man exhibitions, the first being at the J. Eastman Chase Gallery, Boston (1887) and the last at the Winchester Public Library, MA (1939). 18 Memorial Shows were given (1940-41). 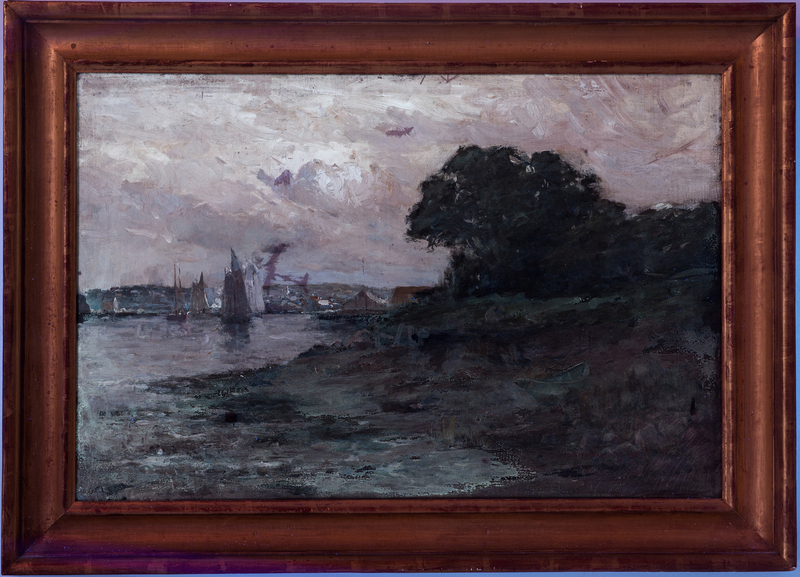 In 1945 the Museum of Fine Arts, Boston held a Retrospective Exhibition. 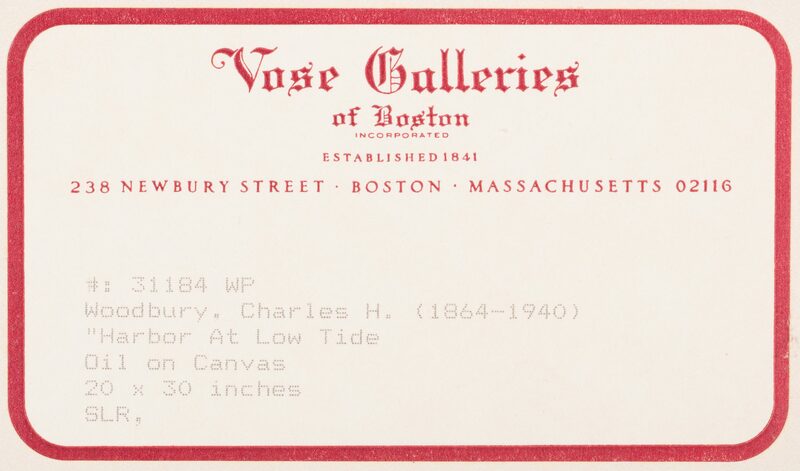 In 1968, Adelson Galleries, Inc. (then of Boston) and in 1978 Vose Galleries of Boston gave Retrospectives. In 1988 M.I.T. gave a monumental Woodbury exhibition titled Earth, Sea and Sky that traveled to museums through 1993. (source: Askart). CONDITION: Light cracquelure, overall very good condition. Scattered abrasions to frame.